Have we been hit by a supernova? When we think of planetary systems and how they evolve, we generally imagine this evolution to be driven by factors within the system itself. We think about what the star is like, how much dust was around, or how the planets interact with each other. Factors outside the solar system — the local neighbourhood of the star — get a lot less press, but that doesn’t mean that they aren’t important. A couple of previous astrobites discussed a paper on the impact that nearby supernovae and gamma ray bursts can have on the habitability of a planetary system. Today, we’re talking about a paper on a similar topic: how would a nearby supernova impact the evolution of the planets themselves? Is it possible that our solar system, in its distant past, was hit by the shockwave of a supernova? Figure 1: Two of the parameters that the simulations tested are the distance between the disk and the supernova (d) and the angle of inclination of the disk with respect to the supernova (theta). Theta=0 for a face-on disk, theta=90 for an edge-on disk. This is Figure 1 from today’s paper. Stars form in dense clouds of gas and dust. When the gas clears, it leaves a close-knit group of young stars called an open cluster. Over time the stars within this cluster drift apart and mingle with the general population of stars, like chicks leaving the nest. However, the length of time that stars remain part of the cluster is longer than the lifetime of the hottest, shortest-lived stars. It’s therefore likely that within each cluster are several stars that live and die before the cluster breaks apart. These deaths would produce supernovae. Given the density of stars within these open clusters, the shockwaves from these supernovae could well have an impact on the surrounding stars within the cluster. Today’s paper aims to model what effect a nearby supernova might have on a protoplanetary disk around a young star. To do this, they run hydrodynamic simulations of a disk of material as a nearby supernova interacts with it. They model two different forms of interaction: the radiation that comes from the supernova, and the shockwave of material that sweeps through the protoplanetary disk. For the radiation, they use two theoretical supernova lightcurves, representative of the variety of supernova lightcurves that exist. They simulate the results when the supernovae are at a range of distances from the disk, and a range of inclinations with respect to the disk (i.e., whether the shockwave will hit the disk face-on or edge-on — see Figure 1). Figure 2: The temperature of different parts of the protoplanetary disk when the supernova is at its brightest. Note that the outer edge of the disk is hotter than the centre, and that the edge closest to the supernova is hotter than the far edge. This is Figure 5 from today’s paper. As might be expected, the disk is heated by the radiation coming from a nearby supernova. The disk isn’t heated equally, however; some areas of the disk are shielded from the worst of the radiation, while the most exposed areas (the outer edge facing the supernova) get the full blast — see Figure 2. This unevenness becomes more extreme if the disk is closer to edge-on with the supernova. From these simulations it seems that the most important part of the supernova-disk interaction is the arrival of the supernova blast wave. The shockwave that sweeps through the system can strip material away from the protoplanetary disk completely. Just like we saw with the radiation, this stripping affects the outer edge of the disk more than the inner disk. The result is therefore a truncated disk, in which the outer edge has been almost completely stripped of material. The deformation caused by the shockwave is also asymmetric, affecting one edge of the disk more than the other as we saw in Figure 2. This can cause the disk to tilt from its original position. We would then see a disk which is misaligned with the rotation of its host star. When we see a misaligned planet, it is normally assumed to be a result of planet-planet interactions kicking the planet out of its original orbit. 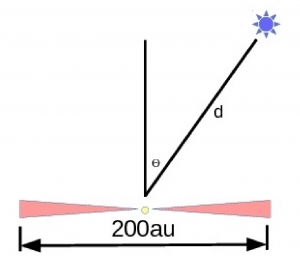 The interaction modelled here would instead cause the entire system to be misaligned with the host star, though the misalignment would be limited to a few degrees. Lastly, the supernova shockwave deposits material from the supernova itself in the disk. This deposited material is a small fraction of the material present in the disk — on the order of one atom for every million in the disk, though it varies depending on how far away the supernova is. Among these materials are short-lived isotopes like Al26. So how likely is it that our solar system was hit by a supernova shockwave at some point in its life? There are a few pieces of evidence that suggest it may have been. 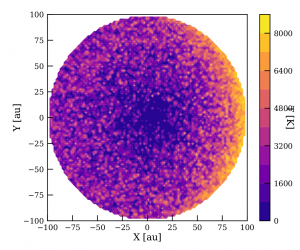 Compared to protoplanetary disks that we’ve seen around other stars, the solar system seems to be unusually small — the edge of the Kuiper belt reaches only about 50 AU away from the sun, whereas most protoplanetary disks we see seem to have radii on the order of several hundred AU. If our solar system’s protoplanetary disk was truncated early in its life, this might explain that discrepancy. Our solar system also shows a tilt like that discussed above — the plane in which the planets orbit (the “ecliptic”) is slightly misaligned with the sun’s rotation. Both of these would be consistent with a supernova going off at a distance of 0.15-0.4 parsecs from the early solar system, at an angle of 35-65 degrees from face-on. The one fly in the ointment is the accretion of supernova material, especially Al26. The models in this paper predict much less deposition of Al26 than was present in the early solar system. It may be that the solar system’s Al26 came from some other source, or it may be that there is another mechanism at play that could increase the Al26 deposition. Overall, it’s inconclusive whether the early solar system was hit by a supernova or not. It would explain some seeming anomalies about our solar system, but it may be that these could also be explained by other means. To be sure, more detailed models may be needed. Until then, today’s paper is an interesting look at this intriguing suggestion. Stellar Flybys and Damping Disks: How to Excite an Exoplanet Migrating Super-Earths vs. Terrestrial Planets New rings detected for old protoplanetary disk Where did my giant planet gift come from?